Monday, October 9, 2017 ~ 2:00 p.m.
Dino Francesco Gori, 91, of Port Angeles, WA, died Monday, October 2, 2017 at his home in Port Angeles, WA due to age related causes. He leaves behind one brother, Al Gori of Santa Cruz, CA, one son, Richard (LaVonne) Gori of Port Angeles, WA, two grandchildren, Brian (Amy) Gori of Seattle, WA and Dana Gori Johnson of Port Angeles, WA, and three great-grandchildren, Revel, Hannah and Beau. Dino was born in San Francisco, CA to Ippolito and Assuntina Gori. He prided himself on being 1st generation Italian, and at the age of 17 he joined the National Guard. 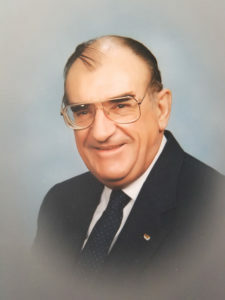 He worked for Southern Pacific Railroad as supervisor of the wrecking crew for 43 years, a job he absolutely loved and was great at. On December 30, 1967, he married Edna (Petty) Mahoney and the two stayed happily married for 33 years. Edna was the love of his life. During his retirement, Dino was an avid bowler and loved to golf, but his true passion was in his woodworking. Dino will return to Nebraska to be with his true love at his final resting place in Papillion, NE.